TMJ and TMD are essentially the same. 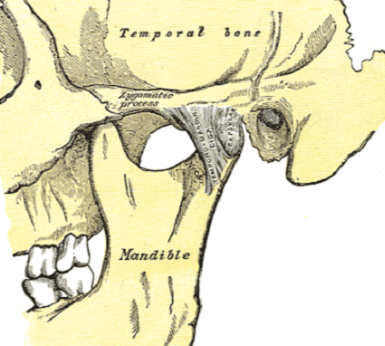 TMJ refers to the temporomandibular joint (pictured to your right). TMD, on the other hand, refers to a temporomandibular joint disorder. TMD is the medical term for a disorder happening at the temporomandibular joint. While dentists prefer to call this degenerative disease by its scientific name, TMD, the public generally refers to this disorder as TMJ because the pain occurs at the temporomandibular joint. As a result, we will refer to the temporomandibular joint disorder as TMJ, rather than TMD, on our website to avoid confusion. A severe lack of stage three and four non-rapid eye movement (NREM), or dreamless sleep, can cause TMJ disorders because these stages heal the body. Thus, without reaching these stages of sleep, the body cannot repair itself and is more prone to TMJ. Lengthened ligaments allow the joint to improperly function, causing jaw pain. TMJ pain resulting from a lack of sleep and trauma can be a warning sign before your ligaments become lengthened. Consequently, it is important to be evaluated for TMJ as soon as possible. A rather common cause of TMJ is an improper seating of the teeth, which prevents your jaw muscles from relaxing at night. Constantly flexed jaw muscles leads to TMJ pain and dysfunction. Bad falls, car accidents, and other forms of trauma can cause joint strain that can lead to TMJ. It is important that you thoroughly examine your head and neck after a fall or injury to the chin, and let it heal accordingly. Please ensure that you treat your TMJ pain correctly. TMJ is a degenerative disease that can get worse over time. Simply covering up the symptoms of a major TMJ problem with Advil or other pain relievers can lead to more discomfort over time.